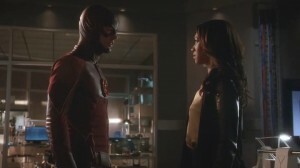 When the particle accelerator is back online, Barry will have to go back in time to stop Eobard Thawne on the night of his mother’s murder 15 years ago. Dr. Wells reactivates the particle accelerator and Barry has to move the Meta humans away. To do that, he needs help and he chooses to ask Captain Cold for it. Article: Whose Secret Is It, Anyway? Enough blog posts have been written about the Flash’s problematic handling of the secret in regards to Iris (and only Iris at this point) to fill a book. I’m not going to write another one – at least, that won’t be the focus of this article. Instead, I want to focus on how Flash handles the secret, how it has utilized this trope differently than other shows and backed themselves into a corner in doing so, and who has the right to decide whether to either keep the secret or to disclose it. “Oh. You’re watching this episode again? 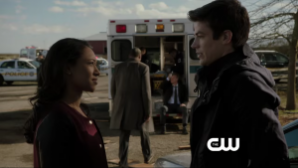 Eh…I’ll be in the other room.” – My husband, a casual Flash fan, pretty much summing up the quality of this episode. When it comes to the shared universe of Arrow and The Flash, the fandom is somewhat divided. Some people love the idea of multiple crossovers. Others want everyone to stay on their respective shows. I’m a little more in the middle. I’ve only seen a handful of Arrow episodes, so I probably get less out of the crossovers than fans of both shows do. That said, I love the idea of crossing characters over – when there’s a good reason. When it makes sense. When it’s an Event. This episode was less an event than a prolonged treading of water, an unnecessary hour of mostly filler. I wouldn’t call it the worst episode of the show to date (although I haven’t entirely decided it isn’t), but it was a baffling waste of a crossover. So let’s get this recap underway. For anyone who reads this, general disclaimer of the fact I’m trying to connect the dots between throwaway lines that the writers likely forgot about as different pairs wrote different episodes, cues given by the actors in their delivery, as well as trying to make sense of what is most likely some bad and misogynistic writing. New Authors and Editors in the website. There are two roles that you can have in this website. The Editors (they are the Administrators of the NewsFlash Podcast) and Authors (They are the Writers or Editors). Editor – has access to all posts, pages, comments, categories, tags, and links. An Editor can create, edit, publish, and delete any post or page (not just their own), as well as moderate comments and manage categories, tags, and links. Author – can write, upload photos to, edit, and publish their own posts. An Author can create, edit, publish, and delete only their own posts, as well as upload files and images. Authors do not have access to create, modify, or delete pages, nor can they modify posts by other users. Authors can edit comments made on their posts. Administrators will moderate the website, when an Author publish something (that is supposed to have been checked by their newsflash editor before hand) we will check it, the comments and everything in it too to keep things well. Authors will only post their own things.